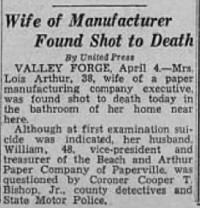 Was the dissolution of the Beach & Arthur Company due to Lois Arthur’s untimely and tragic suicide which husband William Arthur never fully recovered? The Beach and Arthur Paper Company was a paper mill founded in 1926 in Paperville (now known as Modena), Chester County, Pennsylvania. The two partners were Richard White Beach (1896-1981) and William Hamilton Arthur (1894-1947). Both men had Indiana roots, and both owners resided in Indianapolis. Richard Beach was born in New Castle, Indiana, and married Mary Willitts in Indianapolis. William Arthur was born in Nashville, Tennessee, but grew up in New Castle, Indiana, and married Lois Ballenger in Indianapolis. 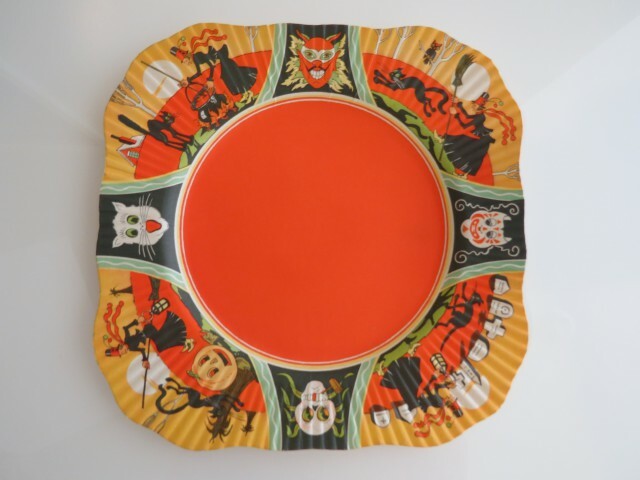 In 1928 Beach and Arthur decided to build a facility in Indianapolis, IN operating as Beach & Arthur, Inc., a paper novelty company engaged in the manufacture of napkins, tablecloths, plates and cups in a wide range of design and color. Richard W. Beach was in charge of rules and distribution and William H. Arthur was the factory manager. For nearly three years the manufacturing firm had been operating in rented quarters in the McCoy-Garten Building at 221 West South Street, Indianapolis, IN prior to opening their own plant in 1931 at 2906 Columbia Avenue in Indianapolis, IN. Their initial site was in the city block where Lucas Oil Stadium is located today. The paper products Beach & Arthur, Inc. manufactured in its Indianapolis paper factory were primarily associated with the food industry. 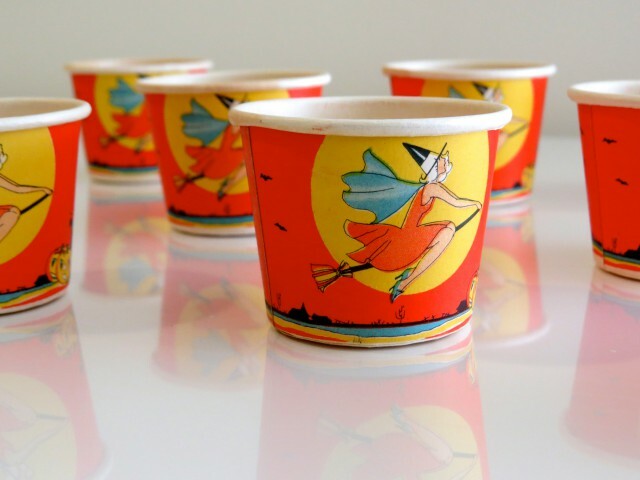 They produced colorful paper plates, cups, napkins, and tablecloths for holidays and special events, as well as designing and patenting boxes for carry-out food. The style of their fine artwork was very distinctive. 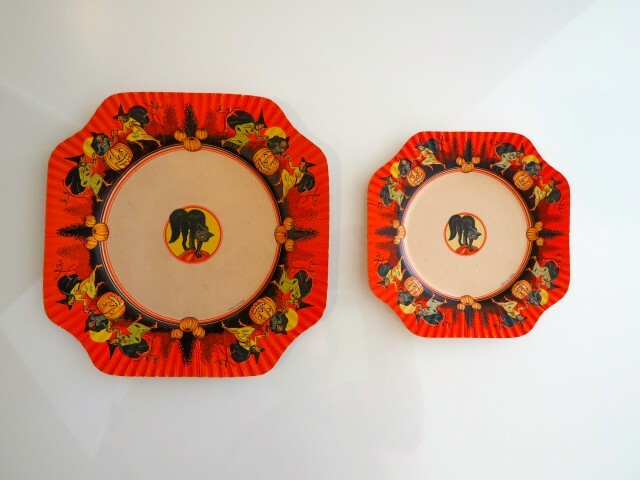 The graphics were extremely well defined and symmetrically woven throughout the patterns of their designs. Early in 1938, William and Lois Arthur and their children, Joan and William Jr., moved to an estate in or near Paperville, Pennsylvania. Within weeks of settling into their new home, Mrs. Arthur took her own life. Reportedly the slump in the stock market drove her to despair. By 1941, only a decade after completing their new building, Beach & Arthur, Inc. ceased operations in Indianapolis. Neither Richard Beach nor William Arthur can be found in subsequent Indianapolis city directories after their plant closed. The two men went their separate ways. Richard Beach to Kalamazoo, Michigan establishing Beach Products, Inc. and William Arthur to Cincinnati, OH after his wife’s death. 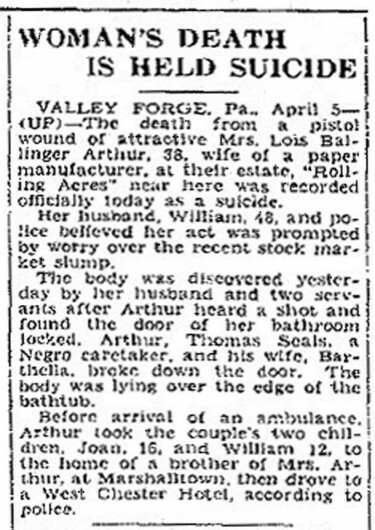 Grief stricken Arthur sent his daughter Joan “Joanne” to business school in New York and his son William Arthur Jr. (age 12 at the time of his Mother’s death) to live with his maternal Grandmother, Eva Ballenger, in Milroy, Indiana. The Indianapolis News, Sept., 12, 1930. Beach & Arthur to Begin Construction on New Plant. No further records could be located on William H. Arthur or any information indicating whether he re-established himself in business. Arthur passed away in 1947 (aged 53) six years after the closure of the plant. 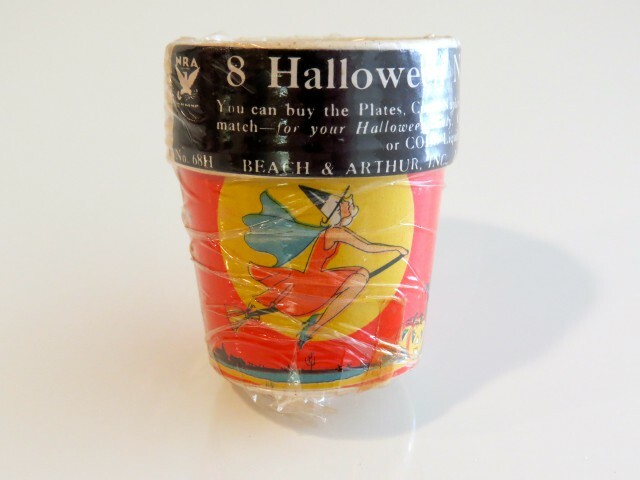 The Beach and Arthur Co. was in operation for a mere 13 years, greatly contributing to today’s scarcity of their disposable paper novelty products.